Nitrogen is an inert gas. It does not react to temperature changes nor is affected by humidity, two environmental issues that can affect tires filled with ambient air. For example, tires filled with ambient air can fluctuate in pressure due to ambient air changes, thus causing the Tire Pressure Monitoring System (TPMS) warning light to activate. Since nitrogen-filled tires do not fluctuate with temperature changes, that occasional warning light activation will become a thing of the past. 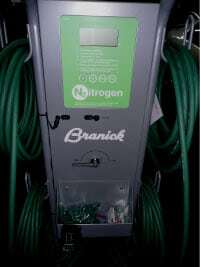 We are currently the only repair shop in Austin that will replace the ambient air in your existing tires with nitrogen. All other repair shops or tire centers require the purchase of new tires for the nitrogen filling service. It takes about an hour on average to replace the air in your tires with pure nitrogen. If you have a full-sized spare tire, we can fill that with nitrogen too; please note that the location of your spare tire can add extra time to the tire filling service. We do not recommend filling space-saver spare tires with nitrogen as these tires are designed for temporary use only and should not be left on a vehicle long-term. We charge $55 in labor plus a $19.95 material fee for this service. A full-size spare tire is an additional $10. We will refill a repaired tire for free for 2 years or 24,000 miles. If you belong to our Lifetime Oil Change Club, the refill service is free as long as the membership is maintained.